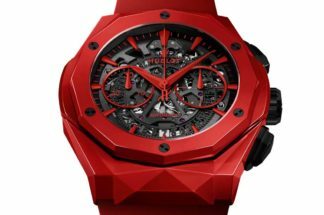 Last November, one of the most highly anticipated watches at the Only Watch auction was the F.P. Journe Monopusher Split-Seconds Chronograph. 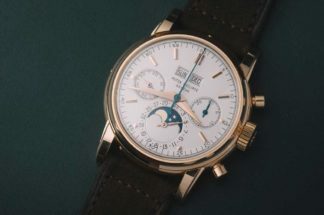 The unique timepiece, in a tantalum case with a blue dial paired with a bold orange tachymeter and yellow telemeter scales, fetched 1.15 million Swiss francs at auction, becoming one of the most expensive independent timepieces ever sold at auction. But that’s not the last we’ve heard of this impressive F.P. Journe chronograph; earlier this year, the watchmaker announced three new chronograph models in the LineSport collection inspired by it: the Chronograph Monopoussoir Rattrapante. Of course, this new model is only based on the Only Watch timepiece and not entirely the same. But the Chronograph Monopoussoir Rattrapante is still a special watch. F.P. Journe continues to wow us time and time again. He rarely does sports watches and this reference comes with a rare complication. There are three new models: the platinum, the 18K red gold and the titanium, and two of the models (the 18K red gold and titanium) landed in Hong Kong this month. Naturally, we made a beeline for them as soon as we heard. With a tagline like “Invenit et Fecit” (Latin for invented and made), F.P. Journe’s utter dedication to the design and production of each element of his wristwatches is evident. You’d be hard pressed to find another watchmaker who would put as much care towards the dial design as they would in the construction of the movement. But such is F.P. Journe’s creations, which all bear an unmistakable design code that speaks of balance and symmetry. It is this philosophy that draws in a realm of collectors who are extremely serious about their watch collecting, and who generally want classical aesthetics and quality on the top level while equally desire to be avant-garde at the same time. F.P. Journe delivers just this. The Chronograph Monopoussoir Rattrapante, at 44mm in diameter, is on the larger side for F.P. Journe watches, but at 12mm thick, it fits comfortably on the wrist. 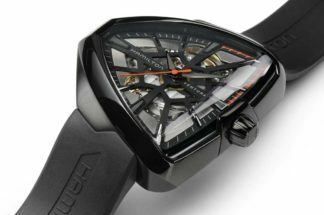 The watch also comes with a power reserve of 80 hours, making it possible to run the split-seconds chronograph function for an extended period efficiently. The date window at 6 o’clock is large, legible, and entirely befitting a sporty watch. Adding to the sporty aesthetic are the presence of protective rubber inserts on the case and bracelet links. On the red gold and platinum models are matching bracelets with a matte finishing, while the titanium version has a bracelet identical to existing LineSport models. The crown is also rubber-coated, but the two pushers at 2 and 4 o’clock are in matching metals. We’re particularly drawn to the red gold version with its understated ruthenium-plated silver dial, although the titanium model is probably the more unique and the sportiest of the three. The anthracite dial is made of aluminium alloy, but the two sub-dials are made of sapphire discs. Striking red accents in the sub-dial hands and the oversized date display complete the look. The hour and minute hands are also filled with Super-Luminova, the only model to have so. The titanium model is also much lighter than the red gold and platinum versions. Apart from the case, the model’s movement is also made of aluminium plates and bridges, while the the same parts are made in 18K red gold for the red gold version. The new caliber in the watch, the 1518, is entirely made in F.P. Journe’s manufacture, and features a chronograph direct gearing with a rocking pinion that avoids the jump of the hand at the start. Is the watch a fitting homage to the unique Only Watch Monopusher Split-Seconds Chronograph? We certainly think so.